Ferrari’s new chairman, Sergio Marchionne, told CNBC the company will likely produce and sell more cars to keep up with the fast-growing population of rich people in the world. But he promised that it will never lose its iconic status as the world’s most prestigious car brand. Marchionne, who will remain CEO of Fiat Chrysler, took the reigns at Ferrari after the departure of longtime chairman Luca di Montezemolo. Clearly, however, Ferrari will change under Marchionne. Di Montezemolo, an Italian aristocrat with flowing hair, tailored suits and a history in racing, was a staunch defender of Ferrari’s exclusivity and independence. He capped production at 7,000 last year to raise prices for new and used cars, and he promised to hold it to 7,000 this year as well. 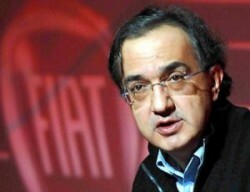 Marchionne has said Ferrari could increase production to 10,000 cars to keep up with growing demand. He said this year the company will increase production to 7,200. Marchionne said he is watching “like a hawk” to make sure the U.S. market is not oversupplied. “You’ve got to be careful about limiting the ambition of Ferrari because its customer base is an expanding customer base,” he said. With the explosion in the number of millionaires and billionaires in the world, Marchionne said Ferrari has to keep pace. He cautioned, however, that there are no real synergies between Ferrari and Fiat Chrysler. Ferrari accounts for a tiny fraction of Fiat Chrysler’s sales but 12 percent of its operating profits.